Oh wow, these empanadas! They have crispy edges, crumbly buttery dough and a nice hearty filling. I didn't think it would be possible to make something like this with low carb flour, let alone without gluten. I'm loving it. Once you get the hang of rolling out and shaping the dough, these are surprisingly easy to make. They are super filling too. I feel stuffed after having just two or three, and this recipe makes eight! If it's just you eating them, you could halve it, or make extra to reheat later. I bet these freeze well too. If you'd like a soy free version, use seitan in the filling and replace the soy sauce with coconut aminos. I bet this dough would also be great for other applications, like hot pockets and even fruit pies (make sure the filling isn't too wet). In a bowl, combine the almond flour, coconut flour, margarine, psyllium husk and salt. Use your hands to create a crumbly dough (you can also do this in a food processor). Add the water and knead a little more. The dough may seem a bit too wet, but it will firm up as the flour absorbs the water. Divide the dough into 8 small balls and put them into the fridge to rest for about 5-10 minutes. For the filling, put the tvp in a small pot and add water until it is almost covered. Add the soy sauce and spices. Bring to a boil and simmer for about 5 minutes until the water has been absorbed. Stir in the tomato sauce and allow to cool a little. Preheat the oven to 180 C / 350 F. Take the dough from the fridge and roll it out into 2 mm (a little less than 1/8 inch) round disks, using a cut open ziplock bag to keep it from sticking. If you have a tortilla press, this is a good moment to use it. When you have a piece of dough rolled out, put about a tablespoon of filling in the center. Fold over the plastic to close and shape the empanada. This may be a bit finicky at first, but don't panic, you'll get the hang of it. If the dough tears, just smooth out the cracks bij gently rubbing the plastic with your fingers. 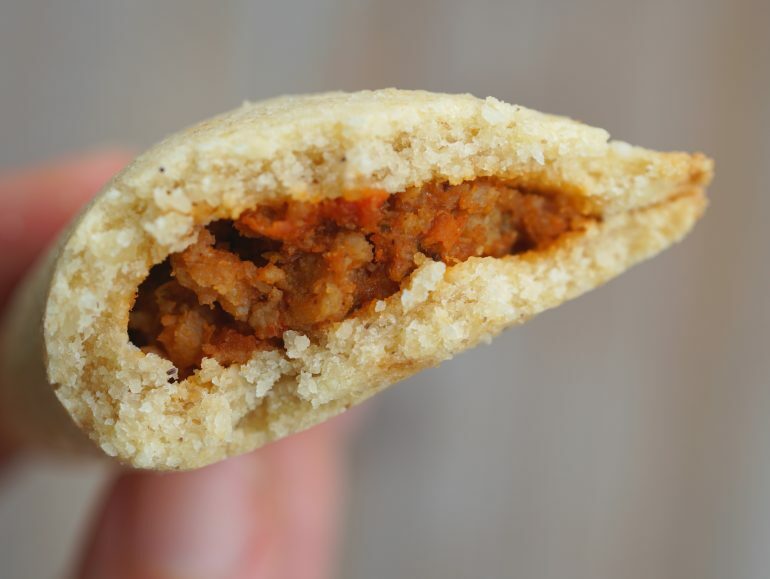 Carefully peel off the plastic from the shaped empanada and place it on a baking sheet lined with parchment paper. Bake the empanadas for about 12 minutes. Allow to cool a little and enjoy! They taste good warm and cold. Serve with a nice fresh salad on the side. 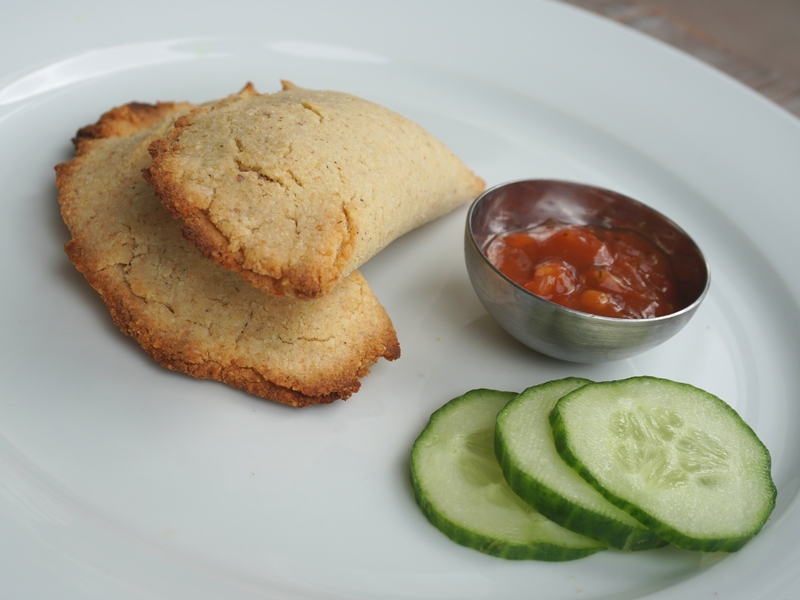 One serving (1/4 recipe or 2 empanadas) contains about 300 kcal, 21 g fat (5 g saturated), 7 g net carbohydrate, 13 g fiber, 11 g protein. Hi Barb, you are absolutely correct. This recipe is nog gluten free if you use seitan. If it needs to be both soy and gluten free, I guess you could use pea protein tvp or nut mince in the filling. HI! This recipe sounds absolutely phenomenal! Where do you get your husk from? Hi Katie, I get psyllium husk from the local pharmacy or health food store. Hi Joelle, you can try, but coconut oil is a lot more difficult to work with because is is stiffer and melts more quickly than margarine. The dough for these empanadas is already a bit difficult to work with, so your results may vary.